When you practice golf, do you do it with a plan? Or do you just go to the range and whack balls. The majority of people in the UK fit into the latter category. They think they’re practising, but they’re not, they’re just beating balls. Nothing wrong with that, as range owners we love it! But if you want to lower your scores and improve your game, a plan is key. In 1999 I started working with the late Adam Hunter. We had a lesson once a month, always followed up by Adam with an emailed plan for the next month. The spreadsheet he’d send would capture all of the stuff we’d worked on, the drills we’d done, and it had a four week progression for my driving range practice. This stuff works – over the 3 years I worked with Adam, my handicap steadily dropped, and I was capable of shooting sub-par rounds in the heat of competition. He helped me shape a game that I could be proud of. Coming back to golf a decade later, having only played less than a handful of times a year since 2006, I’m going back to basics. As I wrote about a couple of weeks ago, I recently had a lesson with my brother using the Flightscope. Niall gave me some drills to work on and I’ve been doing those whenever I go to the range with Andy. Today was the first day I’d been able to go to the range on my own and hit 100 balls. So I went back to how I used to practice. First off, I did a full warm-up. Hitting balls when you’re muscles aren’t ready just leads to bad shots and frustration. Then I hit 10 balls to loosen up, mostly with the wedges. Now I was ready for the main part of the session – 8 sets of 4 drills & 2 full shots, thinking about the drills on each shot. I put in a quality session, taking my time and swinging smoothly. I have an image of Paul Lawrie in my mind when I swing – he has such a beautiful rhythm. Then I played 9 imaginary holes at the course I grew up on – the Island. It’s a great way to practice. You start off on the tee at the first hole and hit the shots you would play until you get on the green. Then you move on to the next hole. 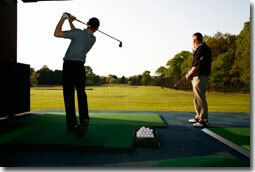 I do this as if I’m actually on the course, full pre-shot routine and visualise the shot I want to hit. My imagination is pretty good, so I can actually ‘see’ the hole in my mind’s eye. After that, I’m left with about 20 balls and those are used for short game practice. How many people do you see on the range hitting wedges, chip shots, etc? Not many. But where do you make your scores on the course? Around the green. Adam always told me to finish with 20-30 balls just on the short game. All in all, that took about an hour. It’s the first time since 2002 that I’ve done a practice session like that. It’s hugely satisfying – you know you’ve put in a shift, and that every ball has counted. I’ll be doing a lot more of this, with Niall’s help, over the winter. So that by the time March comes around, I’m ready…. Previous Post Argos – a broken model? Next Post News of the World! Hey there! Sure, happy to do that (but not totally sure how!). Hi there. I’m travelling now, back home Sunday night, so I’ll do it then. that is fantastic thank you alasdair. good luck!